Autograph Test: Real or Fake? If you read about my first autograph you might recall the shine test. 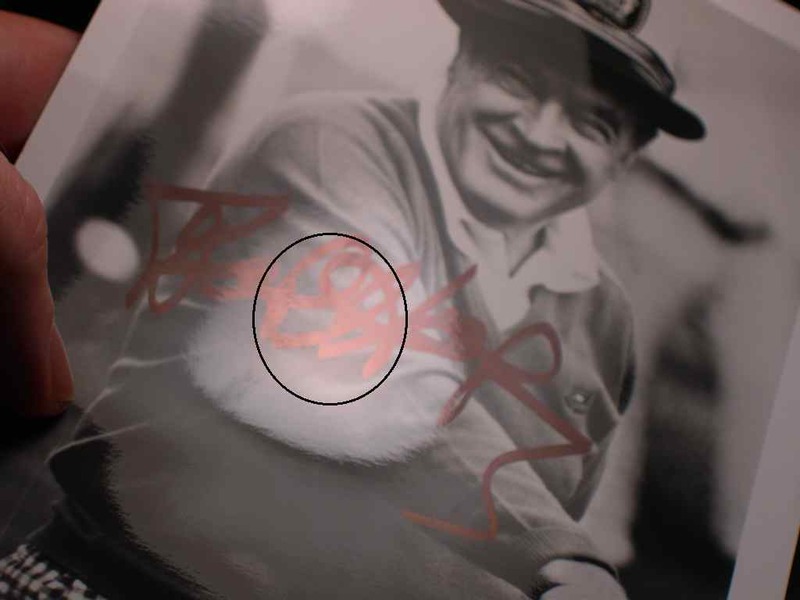 Hold your autographed photo under a bright light so that a strong shine appears on the surface. Move the photo around. Examine how the image of the celebrity is no longer visible under the blinding shine spot. Now move the shine spot to the signature. 1. Does the signature blaze different colors? Yay! This is a good sign. 2. Does the signature disappear just like the photo image did? If so, it probably is a preprint (a printed copy of an autographed photo by the celebrity). 3. Does the signature remaine in the blinding shine but appear dull? This is probably a rubber stamp or autopen. A REAL INKED AUTOGRAPHED SIGNATURE 1. A Real Autograph: Observe how the ink blazes different colors under the light. The Ink is Over the Gloss of the Photo. The signature is still distinguishable under the shine and blazes and radiates different colors. Ink is like a high gloss paint. It is a shiny, reflective coating. Black, blue, purple, red, green inks will all shine differently on glossy paper but all become almost iridescent. Silver and Gold ink seem to have different qualities to them. This ink will still be apparent amongst a bright photo shine though won’t change colors as much but glitter more. To me these are all good signs. The ink is real, not preprinted. AUTOPEN AUTOGRAPH SIGNATURE 2. A Pre Print Pre Printed Autograph Signature: Observe how the signature dissapears under a bright shine. The autograph is under the gloss of the picture. The signature dissapears into the picture and the shine is most dominate. This means it is a preprint. A photo was originally signed and you have the color xeroxed copy of it. It is also called a fascimile. Look at this photo. You will see how his shoulder dissapears into the shine. The signature also dissapears right along with it. If this were real ink it would stand out and blaze different colors. (3. Auto Pen Autograph Signature: Observe how the lines are too thick. The ink is Over the photo gloss like Tar. 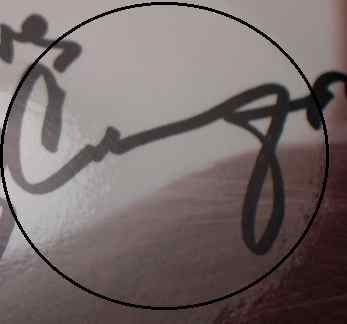 In this case the signature has a dull, almost textured appearance, like if tar was spilled and dried on your photo. Sometimes you can almost feel these types of signatures. Also you will notice the lines are WAY TOO THICK! Autographs become wider and thicker when they are reproduced by preprints or autopens. Signautures are never this thick unless someone signed with a HUGE pen. However, writing with a big pen does not produce neat, clean handwriting like this example. The signature is still distinguishable under the shine but does not blaze and radiate different colors. It may shine a little but won't blaze in brilliant colors. You will see that handwriting is smooth and flows. Usually it appears as though the writer wrote very quickly. Notice marks: hesitation, heavy pressure and light marks trailing off. Sometimes you will notice the dot at the end of a letter as when you write the letter "N". Look at cursive writing and how it crosses over itself in layers. Observe the thicknes. When you draw curves you will notice the edges are round and not edgy. Machines have a hard time getting all this Human Touch right.